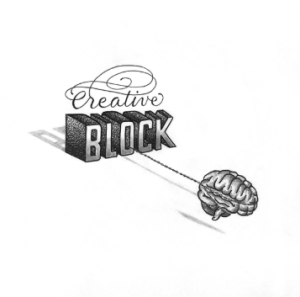 Writers’ block, designers’ block, whatever-you-want-to-call-it block; every creative pursuit has their version of it. By trade, I am required to do some kind of creative thinking every day. Whether designing a web site or writing ad content, my brain is put through its paces to come up with something original or at least creatively interesting. The problem for me is, I have never felt like all that creative of a person by nature. That may come as a surprise for some of the people that know me, but being creative by profession is something that I have learned because I enjoy it. There is little that tops the satisfaction of a final creative that people enjoy. Maybe it feeds that inner self that has always desired praise and attention. I admit it, I like compliments even though they are hard for me to take in person without a sheepish feeling. Even as a kid I tried to be an artist in any way I could and usually failed. I took an after-school cartooning class which caused me to come to the early realization that I can’t draw to save my life. I wish I could draw, paint or something artistic with my hands. I used to use tracing paper over comics I liked to get some satisfaction of feeling like I had created it myself on paper. Kinda sad really. This is where computers became a big part of my creative outlet later in life. Early on I enjoyed being able to make my school reports look better than the next guy with clip art and professional page layout; at least as professional as an 8th grader can make something on an old Apple IIc. Of course, my favorite skill I learned early on was how to change the line spacing to 2.2 or 2.4 to get the extra page I needed on the report without writing another word. I always wondered if my teachers ever noticed. Adobe Photoshop has been my favorite program of all time from the day I found it. I started fairly early in the life cycle at version 2 and have been taking advantage of what it has to offer with every version since. Photography was something that always interested me too, but my passion for it really took off when digital photography began to really grab hold. Why do I tell you all this? Basically to confess that I love being creative, but I have to work at it. I envy those that seem to just come by it naturally, cranking out new creations seemingly without effort. My brain seems to reside firmly in the middle with some logic that truly creative guys often lack and a bit of the creative that most programmers figure is useless. Some days it seems like ideas are easier to come by, but typically I have to really wrap my brain around a new project for a bit, look around the ‘net a long time for similar ideas and work at a half dozen ideas until I come up with something that works. At other times, I feel like I am perpetually doing the proverbial head banging against the brick wall, and usually have a headache you would expect in doing that. So, I take a few minutes to write my rant so hopefully, someone out there can feel my pain and perhaps share their sympathy. Ok, the moment of self-pity over. Back to work.